8½" (21.5 cm) foot circumference and 10¾" (27.5 cm) long. This pattern is available from interweave.com for $19.58. Beautiful examples of folk socks and stockings can often be found in museums. These gorgeous garments can range from elegant one-colored Swedish twined stockings to elaborately patterned and colored Fair Isle socks. It is the riotously patterned and exuberantly colored knitted Estonian stockings from the Estonian island of Muhu that I turned to for reference for these socks. 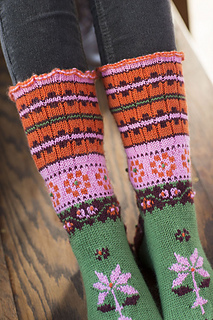 The Tóka socks have been knitted in the round with 5 doublepointed needles from the top down using a traditional Estonian cast-on, colored rib patterning, and several bands of Estonian patterns. These have been embellished with duplicate stitches and French knots. There is a single flower motif on the foot to demonstrate the clever technique of knitting single areas of pattern in the round, and the toe is shaped using the distinctive Estonian toe shaping technique. Traditionally, Estonian heels would have been knitted after the sock was completed, but I have designed the Tóka socks with a turned heel and shaped gusset. Needles Set of 5 size U.S. 2 (2.75 mm) double-pointed (dpn).